In simple terms, insomnia is lack of sleep. Insomnia deprives a person of mental rest and thereby interferes with one’s day-to-day activities. It is most commonly experienced in old age. What are the Reasons for Insomnia? 1. Insomnia attacks those who are extremely hyper or are stressed and over exerted. On the other extreme, even those who do not have a very active lifestyle can be insomniacs. 2. Lack of physical activity. 3. Lack of nutrients due to an unbalanced diet. 4. Constipation, overeating, anger and mental tension are some other causes of sleepless nights. Try one of the following remedies before going to bed to enjoy a peaceful night of restful sleep. 1. 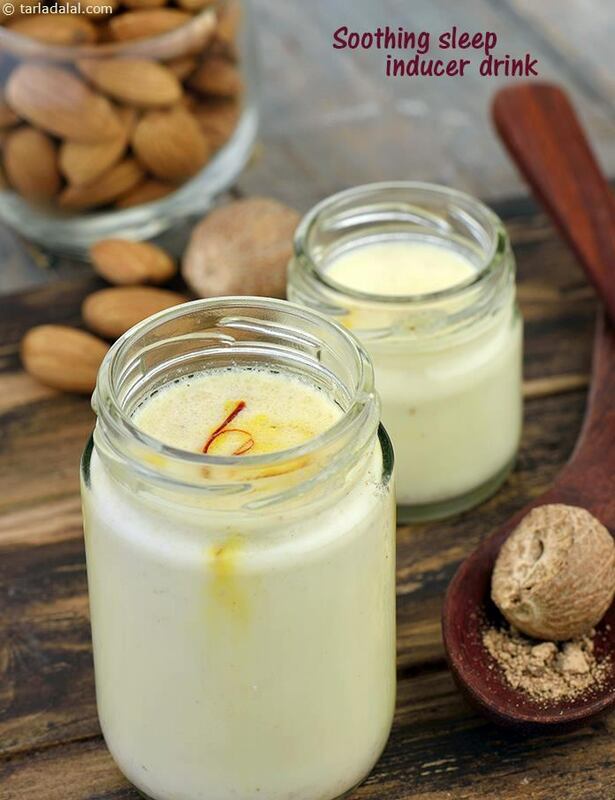 Milk: A glass of milk with or without honey mixed with turmeric powder taken just before going to bed daily is the best remedy for insomnia. Try Soothing Sleep Inducer Drink, for all-in-one remedy to insomnia. throughout the day. 2. Curds (dahi): Consume plenty of curds throughout the day. This helps in inducing sleep. 3. Onion: Consumption of raw onion at dinner time helps to overcome restless nights. 4.Nutmeg (jaiphal): Nutmeg powder mixed with water is an effective remedy for insomnia. 1. Adhere to a regular sleeping schedule, going to bed at a fixed time each night and getting up at a fixed time every morning. Early to bed and early to rise is a good rule. 2. Take a warm bath just before going to bed. Wear loose clothing and curl up with a relaxing book to unwind and induce restful sleep. 3. Try and avoid smoking and caffienated beverages as they can make you more hyper and retard relaxation. 4. Consume plenty of fruits and vegetables in any form as deficiencies of nutrients often lead to lack of sleep. An easy way to meet your nutrient requirement is to make salads a part of both your major meals — lunch and dinner. 5. Limit liquids of any kind for at least 1½ hours before bedtime as the need to urinate may wake you up in the middle of the night and break your restful sleep. It takes about 90 minutes for the body to process liquids. This problem is faced especially in older people. 6. Controlled breathing is also a great help in inducing sleep. The method is to lie on your side in bed and then take three deep breaths expanding the abdomen completely. Then hold your breath as long as you can. Holding the breath leads to accumulation of carbon dioxide which induces sleep. 7. Regular, active exercising during the day and mild exercise at bedtime enhances the duration and the quality of sleep.